Outdoor pools in Minnesota? We promise we aren’t crazy. If you take a drive around neighborhoods in Minneapolis or St. Paul, you might be surprised to see that they’re more common than you might think. Lake homes and cabins are becoming a thing of the past as more and more homeowners are focusing on investing in just one home that has everything they could ask for, including all the luxuries of a holiday resort. As “staycations” become more popular across the country, many homeowners are seeing the wisdom of taking their vacation money and putting into relaxing outdoor living areas at home. When the hot Minnesota summer finally comes around, you’ll be glad to have a place to cool down just steps from your back door. Pools provide easy, spontaneous entertainment for you and your loved ones. Floating in the pool or soaking in a spa with friends is a great way to de-stress at the end of a busy workday or liven up a backyard cookout. You can jump in any time without having to pack up the car, spend time on the road or pay for memberships and entrance fees at community pools or other popular swimming spots. Pools and spas aren’t only useful for cooling off. If you’re looking for a fun way to exercise, a pool is perfect for low-impact aerobics. Additionally, spas are helpful for muscle aches and injuries. Forget paying expensive gym memberships; you can have all the health perks of a pool or spa at home. Pools and spas are available in an almost endless variety of shapes and sizes, from the standard rectangular lap pool to the newer, free-form beach entry pool. Installing a pool or spa for your home is just the first step to creating the perfect entertainment and relaxation center. Today, there is a nearly endless selection of pool designs, pool equipment, installation materials, accessories and devices to choose from. While we at ALD do not do any of the actual construction of the pool or spa itself, we do have a network of reputable pool contractors in the metro area that we’ve partnered with for years. We can refer you to one of these companies. You can choose to work with one of our trusted affiliates directly, or we can act on your behalf as a general contractor for your project. Once the installation is finished, it’s time to turn your thoughts to restoring and improving upon the landscaping in your yard following all the excavation and pool construction work. ALD can custom design an outdoor space that perfectly fits in with your new pool or spa. By using a number of other features, services, and techniques, we can accentuate, highlight, and add extra functionality to your pool and spa areas. We call this poolscaping. The positioning of your pool on your property, deck spacing, and the possibility of adding other landscape design features to your pool or spa areas are all things which need careful planning and thoughtful design. Of course, you have ideas about how you want your area to look, too. We have the expertise and tools needed to custom design and install poolscaping that will beautify and elevate your new investment while staying true to your aesthetic. Hardscapes are the areas on your property built with traffic in mind, including walkways, stairs, and patios. If you need a space for poolside lounge chairs, outdoor dining sets, or a pathway from your backdoor to your pool, we can install a durable and attractive flat surface. Hardscape designs are versatile and easily customized to suit your property. Read more about our hardscape services. Water and fire complement each other beautifully, so it’s no wonder many of our clients want to include a fire feature near their pools. We can install outdoor fireplaces or fire pits perfect for warming up after a quick evening dip in the water. 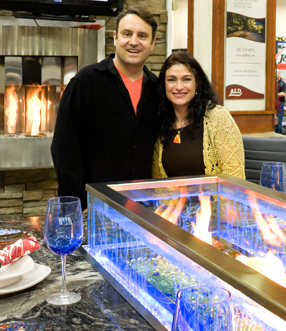 We offer custom designed fire features built in-house, as well as a number of pre-made options. Read more about fire features we offer. Water, water, everywhere. If you’re looking to create a real impact with your pool or spa area, you may want to consider adding a waterfall feature to your poolscape. Using natural stacked stone and boulders, we can create a mountain fall right in your backyard, complete with the soothing sounds of rushing water. Read more about our water features. Turn your pool and spa into an entertainment center for friends and family. If you’d like to serve poolside drinks or throw a poolside party this summer, we can design an entire outdoor kitchen for all your food prep needs. Ranging from simple stone-top bars for a cocktail to full set-ups with gas and running water, your pool/kitchen combination will be both impressive and functional. Read more about our custom outdoor kitchens and other outdoor living spaces. If you want to enjoy your pool or spa under the stars, a low voltage lighting scheme is a must. Our variety of easy-to-install LED lighting fixtures add a glow that enhances both the atmosphere and safety of your pool and spa areas. Read more about our versatile and economic lighting designs. We have a number of photos of our past poolscaping work available. We think you’ll be impressed with how we’ve helped clients turn their pools and spas into spaces with the look and feel of luxury resort areas. Whether you need help planning your pool area from scratch or want to improve your existing pool or spa area, we’re ready to make it happen. If you’ve decided to make this year the one you vacation at home, give us a call at 952-242-9368 or send us a message to schedule your free, no-obligation consultation today.